I was hoping that the first fish landed on my fly rod would be a might more glamorous, but sometimes one can’t be choosy. This weekend Christopher and I headed up to the cabin Friday night, and Saturday morning headed down to Kistler Ranch to join the Diablo Valley Fly Fisherman club to throw our lines in the three ponds there. The ponds are home to bluegill and bass, but we quickly found out that without waders and/or a floatation device, our options would be limited. I decided I would make the best of it, and use the opportunity to practice my casting. I worked my way around to the few spots on the first pond, then found a second of the back pond where I could cast from the shoreline, free of weeds, and place my fly — a white Clouser fly at this time — near some tree branches overhanging the bank and water. As my casts improved, I was able to land the fly closer to the branches, almost softly with a minimum of sound. 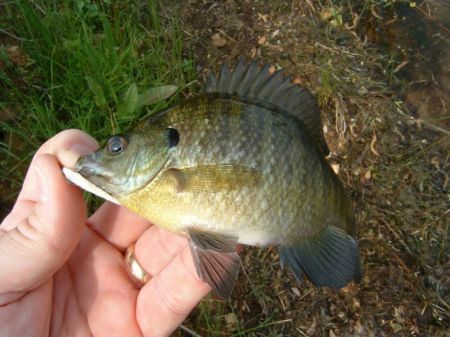 First fish on a fly rod…Kistler Ranch Bluegill. After one particularly good cast, I felt a tug, as if the hook was caught on a weed. Then the line moved towards deeper water. Fish on! It wasn’t much of a battle, and the fish didn’t jump. But bluegill don’t usually jump. Sure, I would have rather caught a decent trout, but a fish is a fish, and the fact that I fooled it with a fly gave me renewed confidence that perhaps I can get a handle on fly fishing. And it was a decent sized bluegill. I spent the rest of my time on the edge of the largest pond, throwing a mouse “fly” into some weed beds. Again, I was practicing (it seems particularly hard to cast this fly) when suddenly my lure was literally attacked, probably by a bass. The fish immediately took to the bottom and wrapped my line around the weeds and somehow slipped off the hook. But it was an exciting 20 seconds, that’s for sure. Sure hope I can get a trout on the end of my line next weekend, which just happens to be Opening Day. Categories: Fly Fishing, Twain Harte | Permalink.